Tamil Nadu 10th Model Question Paper is available in PDF format for free download. Directorate of Government Examinations, Tamilnadu conducts SSLC 10th standard public exam on Mar-April every year. We upload 10th Standard question papers for all subjects both in English and Tamil languages. Students how are appearing for 10th Standard public exam advised going through previous year model question paper. 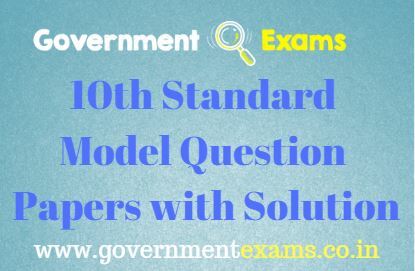 We also upload TN 10th Model question paper for upcoming 2019 exam, kindly visit that too. SSLC 10th Question Paper will help to the understand exam. Download PDF, take printout and read before you appearing the public exam. 10th Samacheer Kalvi Textbooks for all subjects available in PDF format, Click the link to Download – Samacheer kalvi 10th books. Class 10 Bookback question and answers PDF, Click here to view – 10th book back question answers. 10th/ SSLC Examination Starts from March 14th, 2019 to 29th March 2019 will end all the exams(10th exam timetable 2019 – Click to view 10th Exam Schedule). 10th Class Exams are allotted 2.30 hours only. Also, Govt has announced the TN 10th / SSLC Exam Results for 2019 will be released on 24th May 2019. Also, see SSLC/ 10th Previous Year Question papers PDF click the link – 10th question paper.